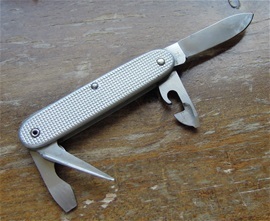 Here is a very interesting Wenger Soldier configuration Alox from 1975. This does not have the WK+ stamp on the emblem or anywhere else on it. We know that these knives were sold private and for the civilian market too. Official soldier knives for the Swiss army contingents should have a Wk+ stamped scale. The Wenger Si or standard issue was sold at different markets. 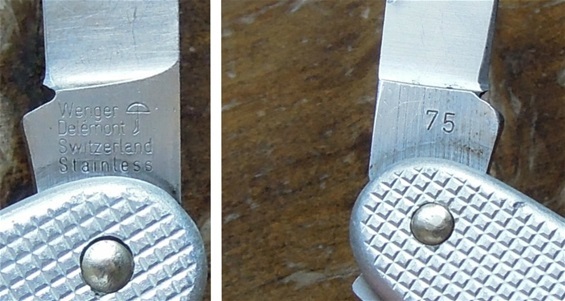 I do not believe all knives used in the Swiss Army with this configuration had the Wk+ stamp. This Wenger knife has been used and at one point the tip of the blade must have been damaged and therefore re-profiled. It is done nice and it is very sharp. I do not believe it had these damages to begin with and therefore rejected from the depot demands. It is normal to find knives that’s been abused or used hard. Re-profiled SAKs does not have any high value anymore but when re-profiled like this you get a lot of use out of it still. It now got character, usability and a story with. All the other functions are ok and it’s been re-profiled in a way that the tip does not come outside the handle when closed in. In other words it will be possible to carry it in a pocket. I gave it a good cleaning and some multi-tool oil for the best functionality. I really enjoy seeing a rescued SAK like this and it is about reusing and resurrecting it intelligently. All the springs are intact and it is another confirmation about the sturdy design these have. Notice the extra rounded rivet/pin used at this time window. One of the biggest problems and reasons for damages are grinding-wheels. The electrical wheel require practice and training. It is far better to use a stone when sharpening at first. The reasons for why the tip can get bent, broken or displaced is prying with it. There is a limit for how sturdy the tip section is. The Standard Issue is specially designed for Soldiers in the field and look at this beast of a flat screwdriver with cap opener, that also got a wire scraper function. There are no reasons for prying hard with the blade tip when you have this to use. It is 2,7mm thick and that is a world of difference. There is no play in any function on this Si. There are few places that can compare to the military when it comes to hard use and wear on equipment. This is many times unavoidable because of the training and exercises. The 93mm Soldier knife is specially developed from the 93mm Pioneer Range with some changes for the Soldiers in the field. Therefore it is also an excellent outdoors, sports and utility tool for a wide range of tasks ahead. I have seen some military used knives in this 93mm category but also the 108mm and 111mm SAKs. It is hard to imagine how such damages can appear. One of the factors that I believe are very neglected in many armies across the world is correct sharpening of the issued knives. It does not take an expert to suggest that many soldiers find an electrical wheel and use this for sharpening their knives. The result is that the wheel is to coarse and the blade jumps up and down too. I was lucky to find this issue that’s been re-profiled nice so it is usable. I do not know if it was damaged in the military or in the civilian life. Regardless it is typically in both worlds. I have seen knives used in the military in Norway too and they are not had it any easier here. I have seen some different categories that is in very good condition. The one big problem is that the knife blade has been sharpened on a coarse wheel with the result of catastrophic edge damage. It is too bad because it was only a bit dull and need a touch up on the edge to restore it to full functionality and someone wanted to do the fast and easy route by using a coarse wheel on it. Different armies across the world use several categories of Swiss Army Knives without the typical military markings. Some can use the German Army Knives 108mm and the later 111mm types. Victorinox designed the 111mm services range especially for the Services to be strong as possible. In is not uncommon that one country’s army can use several knives and this can include standard sheath knives that most people can buy. Typically when it comes to utility and multi-tools it is the utility purpose that is at hand. It is for use in the field. Many times there can be official knives ordered and made for the army or military in one country. Like I said it is not all knives that are official because some countries order privately avoiding information leaking to other countries on what tools one department or branch use. There are several parts in a modern army that require certain tools for equipment. 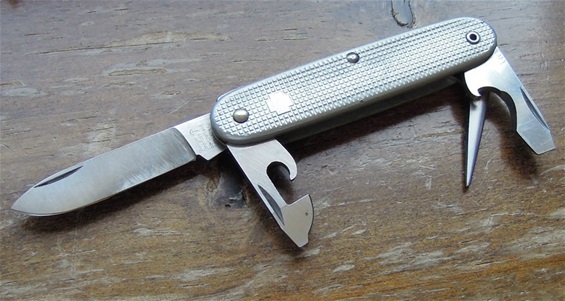 The 93mm Victorinox and Wenger Alox 1961 type with variants was used from 1961 until 2008. That does not mean that the Alox 93mm SAKs category did not continue around the world for use. Several military branches use Victorinox and former Wenger SAKs long before 1961 for their designated branches and departments. This continues until today. It can be knives used in aero planes and for pilot’s survival packs just to mention one.